Most plants, without question, are first seen, but there are also those that are first smelled. While taking a walk through a local woodland clearing one day, a sudden strong scent of gasoline or turpentine wafted into my face. It had perplexed me for some time, until I discovered that the origin of the scent was from a plant. I have come to look for this plant every year in late summer and fall, as it is one of the last native plants to bloom in dry areas in the Rogue Valley of Southern Oregon. Trichostema lanceolatum Benth. (Lamiaceae), or turpentine weed, is an annual Western native from California north into Washington. The plants grow to a height of up to ten inches, often branching from the base. The leaves are of a narrow and tapering to a point at the tip (hence lanceolatum, or lance shaped). The entire plant is covered in dense hairs (trichomes) that secrete a resinous oil, the source of the strong scent which I think is more akin to gasoline than turpentine (or camphor, as the common name camphor weed suggests). The fascinating flowers of turpentine weed are one of the features that make this genus so interesting to me. A related species, Trichostema lanatum, are known as blue curls, presumably named for the flowers. The anthers and stigma are arched out away from the flower, awaiting contact with a pollinator. The shape of the flower, with the arching reproductive structures, are similar to others in the Lamiaceae such as rosemary, Rosmarinus officinalis. Flowers are borne on a type of inflorescence called a cyme. Multiple flowers bloom at once, maturing from bottom to top. Each flower produces up to four nutlets which fall and germinate the following Spring. They seem to respond well to mowing, or perhaps mowing allowed me to spot them easier when I first discovered them in bloom. I also speculate they may have benefited from wildfires in the ages before European settlers inhibited the annual fire cycle. Visible here is the flower structure, the anthers have yet to fully expand, or they have been damaged in some way and are deformed. You can also see the dense hairs, possibly serving multiple purposes. As seen in Madia elegans, the resinous hairs (or trichomes) probably help the plants retain moisture during the heat of Summer. Another possibility is that the hairs, or perhaps more importantly the potent resin, somehow protects the plant from certain insect pests. Those who are color blind may have some difficulty finding the flowers in this image, and if the reader is color blind I would appreciate some input on this. Mule deer, important herbivores in the Rogue Valley, are red-green color blind like some humans. I have long hypothesized that the color of some plants that bloom in dry grass-dominated areas in summer help prevent them from herbivores when the grass is allowed to remain. This is, however, purely speculation. The scent of these plants may be so strong that the smell alone may deter herbivores. I have never seen damage from these plants from herbivores, at any rate. Many of the plants lean generally towards the South, the flowers all being arranged more or less on the same side. For perspective, the South is where the sun is as the days shorten. In winter, the southern exposed sites are the only places to receive a full day of sun, while exclusively northern exposed sites are permanently shaded through winter's entirety. Seed survival through winter, I speculate, may also be dependent on a southern exposure, while a northern exposure has historically resulted in soil that is cold and frozen solid for winters entirety and in general is not very kind to flower seeds (personal observation). The habitat is best described as hot, with what is suspected to be nutrient deficient soil, possibly serpentine (though I do not believe this plant is an indicator of serpentine). The biochemicals secreted by this species and others have allelopathic properties, reducing competition. This could explain why the areas I have found them growing are so sparsely vegetated while the surrounding area is comparatively lush. Growing in poor soil is also a technique some plants utilize since there is generally less competition from other plants. I have observed few native blooming plants in the area at this time of year, limited to Madia elegans, Achillea millefolium, and Eschscholzia californica, aside from the Trichostema. The most common flowering plant here, seen in fields everywhere, is the invasive European native Daucus carota, the wild carrot. This leads me to ask the question, is that all that native pollinators had to forage on? Were there once other wildflowers here for native bees, or is the near end of the pollinator season naturally deficient in native wildflowers, corresponding to lowered numbers of active native pollinators late in the growing season? Perhaps before European settlers made this their home, the few native plants that were blooming were more widespread. The introduction of nonnative grasses and the overgrazing of livestock has probably dramatically and devastatingly altered the landscape to the detriment of biodiversity. What may now look like a native grassland with four or five native species of wildflowers may have once harbored dozens more. We can not know what has been lost, and I am reluctant to believe it can ever be restored. The most common pollinators to visit vinegar weed have without question been woodland skipper butterflies, Ochlodes sylvanoides. Woodland skippers were numerous and frequently visited many flowers on each plant and on multiple plants, suggesting they may be the primary pollinators of T. lanceolatum in this region. I have spent hours observing these plants in different locations over the past three years, and the woodland skippers were and still are the most frequent and numerous pollinators to visit. An interesting characteristic of the flowers of Trichostema lanceolatum is that the reproductive organs swing down onto the body of the pollinator when they land on the flower, causing pollen to be transferred. When the pollinator departs, the stamens and stigma return to their original position. The woodland skippers thorax, in my observations, made contact with the reproductive parts of the majority of the Trichostema lanceolatum flowers they alighted on. In a few instances when the skippers were at rest I was able to observe more closely and noted pollen on the throax of most, as seen in this photo. Crossing of pollen from one plant to the next is a highly likely scenario considering the rate at which these butterflies moved between plants. Multitudes of small bees visit vinegar weed, though I have not observed honeybees to visit them. The most numerous bees have been small wasp-like masked bees (Hyaeus sp., Colletidae). They alight on the anthers, and also on the labellum, seeking either pollen or nectar, respectively. Masked bees are not considered to be very efficient pollinators, despite being bees. This is due to the scarcity of hairs on their bodies. Pollen is eaten, held in a crop, and regurgitated in a nest cell. Many other bees transport dry pollen on special hairs on various parts of their bodies called scopae. Some apid bees (honeybees and bumblebees), in contrast, transport pollen moistened by nectar in specialized structures called corbicula, patches of specialized curved hairs on the tibia of the hind legs of females. Masked bees often nest in pithy stems or twigs, or occasionally in cavities in wood, or occasionally in soil, depending on the species. The walls of the cells are lined with a silk-like polymer which serves some role in protecting the delicate larvae from parasitic or microbial pests (Espelie et al. 1992). Slightly larger than the masked bees, sweat bees were also observed visiting vinegar weed. Unlike the masked bees who would land on different parts of the flowers, the sweat bees nearly always landed on the anthers in my observations. Halictid bees are typically ground nesting bees, nesting in excavated burrows in bare ground. Some species, as well as the related Lasioglossum, are primitively eusocial or communal. In extreme cases this means that there may be one or a few dominant laying females while the rest are essentially subordinate workers though they may also be fertile. Alternatively they may share only a nest entrance while each female excavates and provisions her own cells within. Many still are completely solitary, though of those some may nest in congregations. The largest bees I have observed visiting vinegar weed have been digger bees. I caught one very fast flying individual in order to identify it. Anthephora urbana are slightly smaller than honeybee workers. They are solitary ground nesting bees, with long tibial spines used for maneuvering inside the burrow and stabilizing the bee while excavating the cells. Digger bees are in the Apidae, the family of honeybees and bumblebees, and like bumblebees can sonicate while visiting flowers. Sonication, or buzz pollination, is when the bee vibrates its wing muscles while on a flower which causes the pollen to burst explosively from the anthers and due to a phenomenon which causes the pollen to stick to the bees body with electrostatic attraction. Flowers, thus pollen, are negatively charged due to being, quite literally, well grounded. Bees, and all flying insects, develop a positive charge. I have received the testimonies from others that bumblebees or perhaps large carpenter bees also visit the flowers of vinegar weed, and appear to fit morphologically. I don't doubt their effectiveness as pollinators, in fact the "buzz pollination" of large native bees is highly effective for the pollination of many natives (particularly those with very sticky pollen, released only by the intense vibrating of the wing muscles). But I did not witness any large bees visit the flowers during my initial observations. Such is the variability of time and place. I have also observed beewolves, Philanthus sp., in the vicinity of vinegar weed though I have not observed them visiting flowers. Beewolves, predatory wasps in the family Crabronidae, have common ancestors to modern bees. Plants like this, plants which may be easily overlooked or may even evoke amusing faces when they are detected by scent but unseen, are a particular area of interest for me. In fact, I am often enamored by the small and overlooked, including bees and other pollinators. These small creatures represent small personal discoveries which ignite my wonder and curiosity for the natural world, and inform my opinions of life as a whole. Small creatures with no voice of their own deserve to thrive just as much as I do, yet I dread that their lives are hanging by a thread. Many people don't value life beyond their own. Whether this is resultant of the belief that people are superior to all other lifeforms or the thought has simply never occurred to them is unclear. But small life inspires me, and my goal is that by writing this and taking photos this life may also inspire others. Incredible blossom! Looks like the Skippers love it. My guess is Woodland Skippers - Ochlodes sylvanoides, but I can't say for sure. Did you note other butterfly species using it? Good call on the Woodland Skippers Stewart! I didn't see any other butterflies, in fact I haven't seen any other butterflies ANYWHERE in the garden. The skippers visit many nonnatives like Echinacea, Nepeta, Allium, and even Calluna vulgaris. The only other natives in bloom here are CA poppy and Madia elegans. One other native comes to mind: Verbena lasiostachys; it's still blooming in an irrigated bed. It gets a lot of pollinator attraction, including these skippers. I miss this plant. Great pics! I once watched a black native bumblebee land on vinegarweed flowers. The curving anthers and stigma fit around the head of the bee (in between the eyes) so perfectly that in an instant I was saying, those two species co-evolved together. Bumblebee populations have declined but I would guess that two hundred years ago, they were the dominant pollinator for vinegarweed. The fit is truly amazing!!! Thanks to your post Craig, this dialogue came back in my mailbox, with what seemed like good timing. In my Pacific Northwest butterfly group we've been having a discussion about a crash this year in Woodland Skipper numbers in western Washington, starting with Bob Pyle (Butterflies of Cascadia) reporting a crash in numbers this year at his place in SW Washington, and that dialogue comes up again as another observer, just now reports none this year in her garden in Seattle, when Woodland Skipper is one of 3 butterfly species she can usually rely on each year in her urban garden (along with Western Tiger Swallowtail and Cabbage White). My report from West Seattle is that they have indeed been harder to find than usual (though with an earlier start than usual), but can still easily be found (though not in the numbers I might expect), at the best times, in the best spots (on the Puget Sound beach with the abundant late blooming yellow Grindelia integrifolia - Puget Gumweed - Asteraceae - http://biology.burke.washington.edu/herbarium/imagecollection.php?Genus=Grindelia&Species=integrifolia (I always start on that site by scrolling down for G. D. Carr's exceptional photos highlighting diagnostic features). great pix, thanks soooooooooooooooooooooooo much! 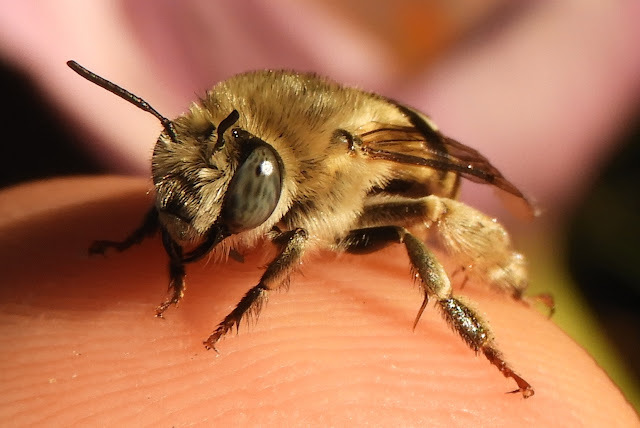 The plant's pollinators in California's Santa Cruz Mountains include bees, among them a strikingly blue-eyed digger bee that I photographed (see https://www.flickr.com/photos/25673579@N04/21964225438/in/photolist-zsUp13-yNBR6M and https://www.flickr.com/photos/25673579@N04/21530969483/in/photolist-zsUp13-yNBR6M/). I also observed other bees repeatedly visiting t. lanceolatum when I photographed woodland skippers last month at Calero County Park. Skippers are abundant in my Gold Hill Pollinator Garden. I am growing a mix of pollinator plants for Gold Hill gardens as part of my Gold Hill Bee City Project of 100 gardens. I am gathering Milkweed seed to grow. I am looking for Heartleaf Milkweed (Asclepias cordifolia) to gather. Also garhering Showy and Narrow leaf to plant this fall as container plants for spring purchase for Gold Hill Monarch Way Stations. Your reports are very helpful to me. Don't make me get out my Jepson's Manual.